Antibiotic use on people or pets, and use of biocidal cleaning products such as bleach, are associated with multidrug resistance in methicillin-resistant Staphylococcus aureus (MRSA) in the home. This contamination of the home environment may contribute to reinfection of both humans and animals with MRSA, and to subsequent failure of treatment. The research is published September 22nd in Applied and Environmental Microbiology, a journal of the American Society for Microbiology. Multidrug resistance to MRSA and reinfection with MRSA, said corresponding author Jonathan Shahbazian, MPH, were the most important in this study. The study also showed that whether used in humans or companion animals, the antibiotic clindamycin was not associated with the risk of multi-drug resistant bacteria in the home. “We also found the presence of domestic pets was associated with multidrug resistant MRSAin the home environment, while the presence of unwanted pests, such as mice or cockroaches, was associated with non-multidrug resistant MRSA strains,” said Mr. Shahbazian. In the study, the investigators collected samples from the home environments and companion animals of households enrolled in a large randomized controlled trial, which took place over a 14 month period. They tested whether household-wide efforts to eradicate MRSA— which included daily use of nasal mupirocin ointment and chlorhexidine body wash–were successful in reducing recurrence of MRSA among adults and children who had previously been diagnosed with a MRSA skin or soft tissue infection. They repeated sampling in 65 homes three months after the residents had been treated for MRSA, or, as a control, after they had been educated about MRSA. “Based on the evidence, we strongly suspect that environmental contamination of the home with MRSA contributes to recurrence,” said Mr. Shahbazian. The investigators also suspect that household-wide selective pressures on the home environmental reservoir of MRSApromote persistence of multidrug resistant strains. “We hypothesize that infected or colonized people and companion animals shed MRSA into the home environment,” which then re-infect household members. 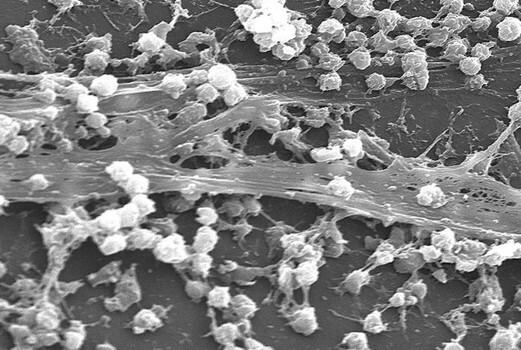 The investigators concluded that a better understanding of what causes home environmental MRSA to become multidrug resistant, and thus harder to treat, could help in identifying which households are more likely to harbor multidrug resistant MRSA, so that these could be targeted for eradication of the pathogen. The investigators are involved in One Health research. One Health examines health problems from a multidisciplinary perspective that includes physicians, veterinarians, environmental experts, and others.